Introducing one of my more ... shall we say ... INTERESTING fashion moments. Let's take it back to my first day of 7th grade in September 1992. 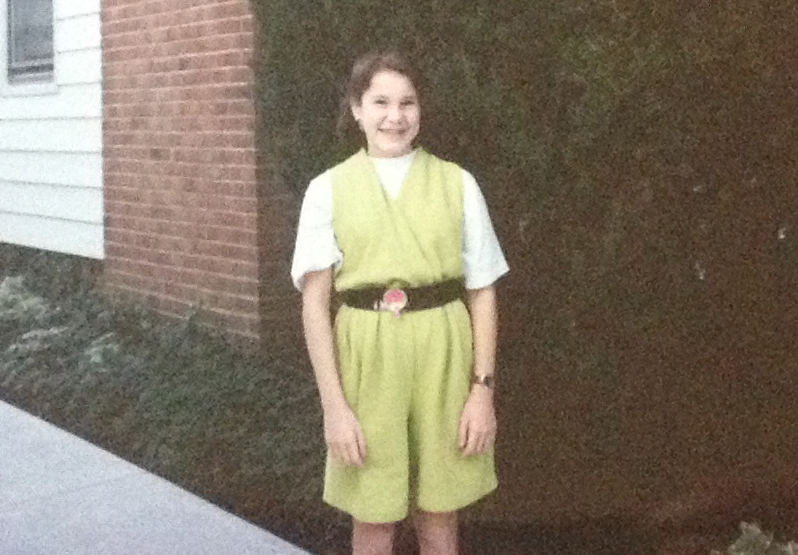 I was beyond thrilled to put together this ensemble, featuring none other than a chartreuse jumpsuit. I really wish I could remember the name of the store where I bought this romper. It was in a little shopping center in Cleveland, and I saw it hanging on the wall in the back right corner. (Seriously, how on EARTH do I remember that when I can't even remember what I had for breakfast yesterday?) The moment I spotted it, I just KNEW I had to wear it for the first day of school. I really and truly have no clue why I thought this romper was cute. Not only is it terribly unflattering -- seriously, look how long the shorts are! -- but that color is just, well, WOW. Chartreuse? Paired with a black belt that had a huge palm tree on it? Really, Jamie? But, as you can see from the photo above, the look gets even better. I added a white tee and black LA Gear high tops (you can't tell, but there are multicolored jewels on the toes). And then, the piece de resistance ... I decided that I didn't want to carry a traditional backpack for 7th grade. 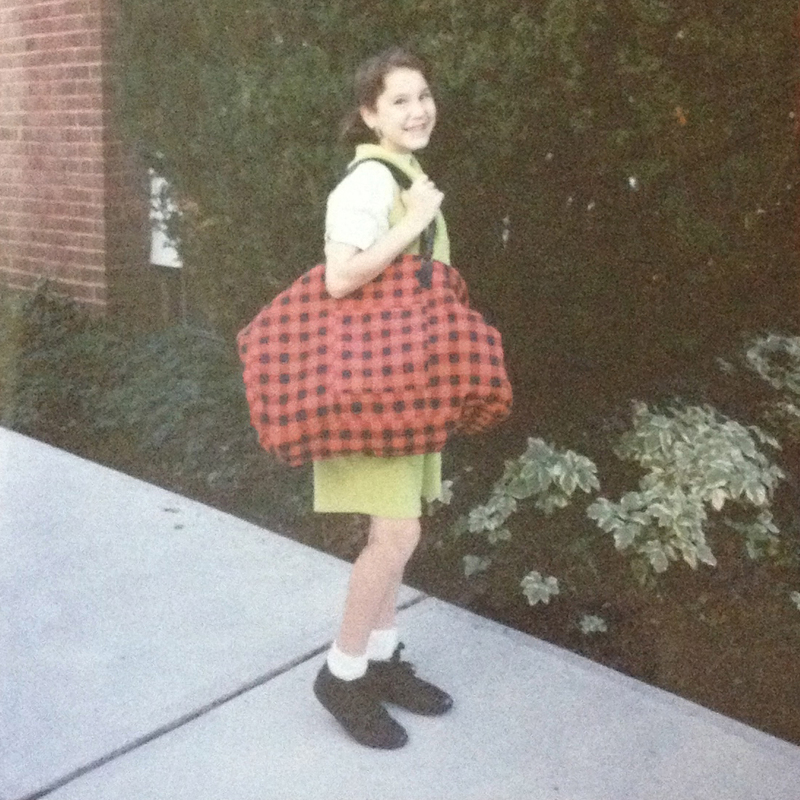 No, instead, I wanted to carry the black and red buffalo check duffel bag you see here. No one else was carrying duffel bags down the halls of my junior high school, that's for sure. Really, what on earth was I thinking with everything happening here? I can't really say, except that at least it shows I was an individual. And that I'm not afraid to poke a little fun at my unique fashion choices of the past! Do you have any fashion moments that make you cringe when you think about them today? Let me know in the comments! Omg that bag! And yes, so many fashion moments. Aren't you glad you still grew up normal!!! It's always fun to look back at fashion/style back in the day! You are SO cute! OMG I hate all my childhood photos because I did not wear a dental brace until I was 13 so I have horrible rabbit teeth. Seriously how cute you are. :D I love your throwbacks... I need to start sharing some of mine... they would be hilarious... yours are adorable. HAHAHA Love it. The jumper is so cute. That bag! I love it!